Karen is the Advancement Chair for Troop 610. She is also an active advisor for Venturing Crew 262. In addition to working with these two units, Karen is also the webmaster for Arrowhead District and the owner/manager of the Arrowhead District email list. Karen is self-employed; she has a successful graphic design and desktop publishing business called KZH Design. 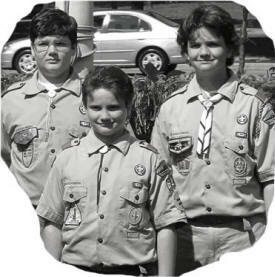 Tim, the oldest son, earned his Eagle Badge in February 2007. He has been involved in scouting since a Tiger Cub. He is currently a member in Venturing Crew 2652. Tim is a successful entrepreneur, working in his own small computer business, HOB Computer Services. He also works part time in the technology department at a local college. He is completing his sophomore year of studies at the same school. Tim was homeschooled from fourth grade through high school. Jeff, the middle son, is an active member of Venturing Crew 2652. He is the current President of the Crew. Jeff does hold the rank of Star and is undecided about completing his Eagle Badge. Jeff has been a scout since he joined as a Tiger Cub in first grade. He is finishing his high school career, as well as his freshman year of college, at the same time. He is planning to transfer to a four year university, where he will double major in computer sciences and theater. Jeff is also active a local community art center, where he performs in various theatrical productions, works on stagecraft and completes many volunteer tasks. Jeff has been homeschooled since second grade. Doug, the youngest son, is a Star Scout in Troop 610; he is also a member of Venturing Crew 2652. Like his brothers, Doug has been an active scout since he was a Tiger Cub. He is planning to earn his Eagle Badge. Doug is a high school freshman. He will start taking computer courses at the local college next year. Doug has an interest in music, playing both the clarinet and the electric guitar. He also likes to create 3 Dimensional designs on the computer. Doug has been homeschooled since first grade. Doug often works as an assistant for his brother, Tim. The Hoogland family believes that scouting and home education are a terrific fit. Their sons have enjoyed the adventure scouting has provided. If you would like to share your experiences with scouting and home education, please email us at info@homeschooledscouts.org. This site, and the information contained within it, has been assembled base on the experience I had at Philmont. This is not an official BSA site; I have put these pages together for informational purposes only.